G4 produced at Destileria el Pandillo- NOM 1579, has released a special treat. It is an extremely limited batch of 55 month aged (4.58 years) Extra Anejo at 90 proof. This Gem is for serious Extra Anejo lovers who can deal with a higher price, but also an extremely high quality fine sipping tequila, from maybe the top Tequila maker in the world. Not only is it aged 55 months in used American white oak bourbon barrels, but only 4 barrels were used and blended, and it's 90 proof 'still strength'. Less than 800 bottles were made worldwide, all signed by Felipe Camarena, and are numbered. This "55" comes in a beautiful but simple, laser etched wooden box with a slide cover and sticker. Felipe Camarena with his sons Alan and Luis make G4 (4 Generations), as well as Terralta, ArteNOM 1579, Pasote, Torai and Volans tequilas. These are all amazing brands, and this is one family of producers who do things the right way.... without cutting corners. El Pandillo, named for Felipe's grandfather's favorite bull, is located 80 miles from Guadalajara, deep in the highlands of the western Mexican state of Jalisco. Felipe Camarena is often called 'the mad scientist', as he has created his distillery with many inventive alterations and upgrades, creating a sensible, efficient operation, allowing him to save money on operation costs. He'd rather put the money into the product that is 'in' the bottle. This delicious G4 "55" is extremely full-bodied, but light in color and not full of oak, even though it was aged this long. The flavors of aging are all there, but in a subtle way, nothing is overpowering, and yes you can taste the sweet cooked agave notes, which shine through. A whiskey/bourbon drinker will appreciate it, although may be baffled at first on the light color, along with the delicious somewhat light barrel notes (SEE COLOR BELOW), and an agave lover will definitely appreciate the way it has these light barrel notes, but also includes the agave presence. This has it all, and a high proof to boot. It it so balanced and light that even with the extra alcohol, is silky and easy to sip. There is a lot of flavors here, and you can taste the elements in the layers. It has definite wood notes and attributes, but for 4.58 years in barrels.... the agave sweetness is without a doubt present. I'm thinking anyone who likes a high proof aged expression, as well as whiskey and bourbon drinkers, who want to take a chance with some lighter wood presence, but want to taste tequila's agave presence....will absolutely adore this. My son Dan (BELOW) for example, who is only used to dark looking and heavy extra anejos, absolutely loved this. He kept looking at the color, saying it's different, but it has everything. 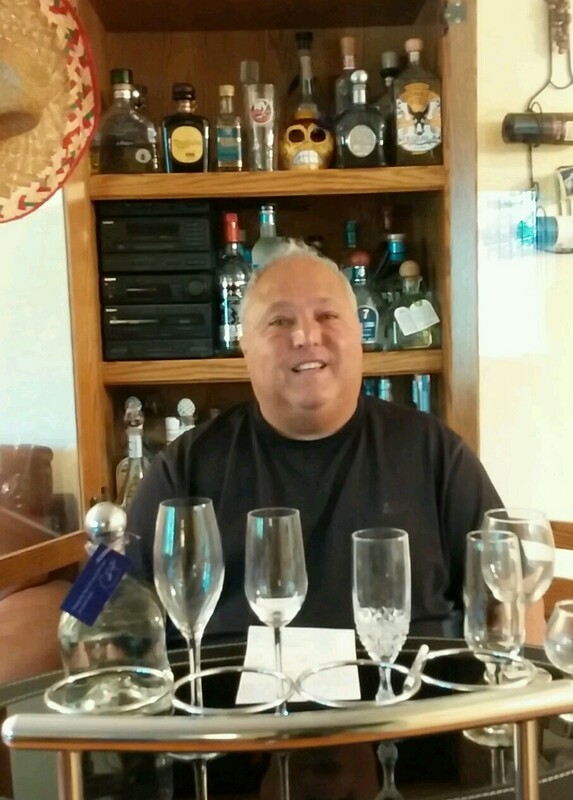 Felipe believes in keeping the agave as forward as possible, and always free from coloring's and additives. With G4 "55" Extra Anejo......he doesn't disappoint. G4 is taking the U.S. by storm as I knew it would. Shawn M. Miller- Head of Global & Distributor Marketing told me "G4 will be in 32 states by the end of March, and we’ve been working hard for the last year, but we’re just getting started." Shawn works with Jeff Ernst- Head of Sales (Chief Growth officer), and they are being very aggressive in doing everything possible to make G4 a huge splash in the U.S. While discussing barrels, Miller said "there is no special treatment of the barrels, which is actually 'special' in this world of over treatment and additives." This doesn't surprise me, as I know Felipe's work well, and his love of the agave taste. He has always felt that the agave needs to be present in his expressions, and this "55" month aged XA is no different. Everything Felipe does, is put 'into' the bottle.... not in the actual bottles themselves or the box, or by doing any phony gimmicks. This is as real as it gets, with a longer aged tequila that shows it's tequila roots. In his own words Felipe Camarena says "I'm not in the business of making fancy bottles, I'm in the business of making great tequila." The bourbon barrels are used for about 20 years before they are retired, and Felipe says "the more a barrel is used, the less wooden attributes it imparts." I like this myself, as I don't need a ton of oak and barrel presence myself, to enjoy aged expressions. As Felipe told me once- "I want to know I'm drinking tequila." As it says on his website, concerning these gentle, and well used barrels- "when we age our tequila, some of ours will stay in for up to twice as long as required for that category, and what comes out is a smoothness and additional character from the barrels." I believe by the way he used these barrels, he was able to age to a long length, getting gentle wood presence and not overpowering the agave notes. (L to R- Shawn M. Miller- Head of Global & Distributor Marketing, Luis Camarena, Jeff Ernst- Head of Sales (Chief Growth officer) and Master Distiller Felipe Camarena. Felipe explains how he built his El Pandillo distillery (ABOVE) to produce tequila as close as possible to what his father and grandfather did. This facility is an example where innovation and modernization contribute in making a better product, but in a traditional manner. His facility has many environmental and efficient alterations, from capturing steam and using it in other parts of the production, catching rainwater and storing it to used later, insulating fermentation tanks so he can work year round, warming tanks for his mosto, so the stills don't have work so hard, creating even oven heating, re-purposing the agave remains and turning it into fertilizer thus reducing waste. His innovations go on and on. His grandfather started the family distillery in 1937 at La Alteña, after the original distillery was destroyed during the 1910 Mexican Revolution. The tahona wheel was all that was left afterwards, which now stands at the front of his El Pandillo distillery (BELOW). Camarena is expanding El Pandillo by adding a massive amount of aging space. They have begun construction of a large new underground storage space for aging, which is an indication of the growth of this great brand, and is clearly an indication that El Pandillo does aging well. Shawn Miller told me that sales of G4 Reposado has now matched the blanco, which is a big exceed of expectations. They are also doubling the ovens, and they are constructing a new outdoor tasting patio and area for guests to hang out. This distillery is all about a man and his sons. Luis operates his new laser etching machine (BELOW) to create these designs on the wooden box, and maybe soon on the bottles themselves. Being a 'Lou's Top Tequila' please see G4's logo on the side of this page, click and visit the G4 website. Camarena uses natural yeast (same as his father and grandfather used) during fermentation in stainless steel tanks that are wood-lined and insulated, which lasts 5 days. Distillation is done in full copper for the first and second distillations, which is more costly, takes more time to clean, and does not last as long as stainless steel stills. Although G4 products use a 50-50 blended mix of natural spring water and rainwater, meaning the rainwater batches from the wet season are blended with the spring water batches of the dry season, to create tequila representative of a year’s work.... no messing around here. Keep in mind that this G4 "55" XA does not have water in it, as it is still strength, and is bottled without adding water. When I asked if they even use the G4 water mix in the sugar extraction, Alan Camarena told me "we do use the same water source (50/50) in the irrigation, during the extraction of sugars, and the steam that goes into the ovens is also the same water source." Only 4 used and unre-charred Jack Daniels American White Oak bourbon barrels were used, which were hand picked and profiled for blending by Felipe, and a total of only 615.5 liters were produced. NOSE- vanilla, caramel, light alcohol, smoke, whiskey/bourbon notes, spice, sweet cooked agave, honey, light leather, light fruit/ berries, some citrus notes, light cinnamon and light butterscotch. TASTE- medium to thick oils in the mouth, sweet agave and bourbon notes, smokey, leather, silky and buttery with honey, light fruit and light citrus with spice, caramel and vanilla and some minor heat on the backend. FINISH- caramel, smoke, spice, honey, leather, minor heat to a medium finish. G4 "55" Extra Anejo is 90 proof (barrel strength), aged for 4.58 years, compared to G4's 80 proof/36 month aged Extra Anejo, and the 5 year single barrel XA, only sold as barrels to special customers. Concerning price, it's like anything else.... it depends how much you can afford to spend, and how much you love a high proof XA sipper. Like other expensive sippers, this could be used for special times. This is a very clean and easy to sip higher proof, and I could taste delicious agave sweetness throughout. This will surprise whiskey/bourbon drinkers as well as blanco lovers who want that agave punch in an aged tequila. This is one of those brands that you never have to worry about what's in it, or how it was made. It was made by Felipe and family.... and that's all you really need to know. I thought it was absolutely delicious.